A few years ago, I discovered that Jess Cartwright’s great grandmother was the child of immigrants from England. Her name was Eliza Hope Danes Cartwright. The child of a silversmith, Eliza and her family won the land lottery in Western Georgia in 1826. Her father died shortly after they homesteaded the property in _________ county, GA. Eliza’s mother Ann Mason remarried a few years later and moved to Carroll County, GA. The person that she married was a Methodist circuit-rider. David Stripling was his name. At the time, Eliza would have been about 15 years old. 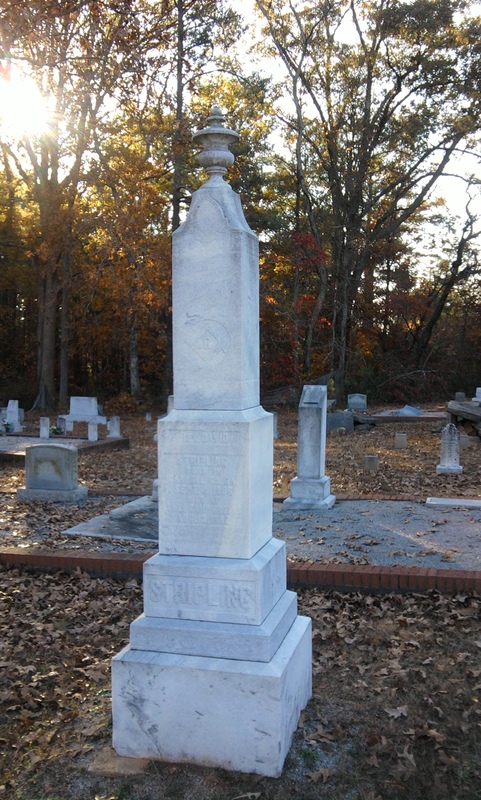 According to records of Butts County, Georgia, David Stripling (1806-1882) had earlier married Ann Butler (1803-1876) in 1828. There are no extant photographs of Ann and David, but there is a very striking grave located outside Carrollton, GA in the cemetery of Smyrna Church. And because David Stripling was such a beloved figure, we have been able to locate more information about the life of Eliza Hope Danes Cartwright. We only know where Eliza Hope Danes Cartwright came from because of the court records that indicate that Rev. Stripling adopted her and her sister. From what I have been able to learn, some folks still assemble every August for the Shiloh Camp meeting. We do not know for sure whether this is one of the reasons why the little church and community where Eliza and her son settled in the 1870s was named Shiloh. We do know, however, that other families (including one of David Stripling’s sons) from Carroll County, Georgia also journeyed west to live in the same area about the same time that Eliza and her eight children moved to Scott County. This entry was posted in from East to West and tagged David Stripling, Eliza Hope Danes Cartwright. Bookmark the permalink.